Huh, it actually does sound interesting! Thanks for the review. 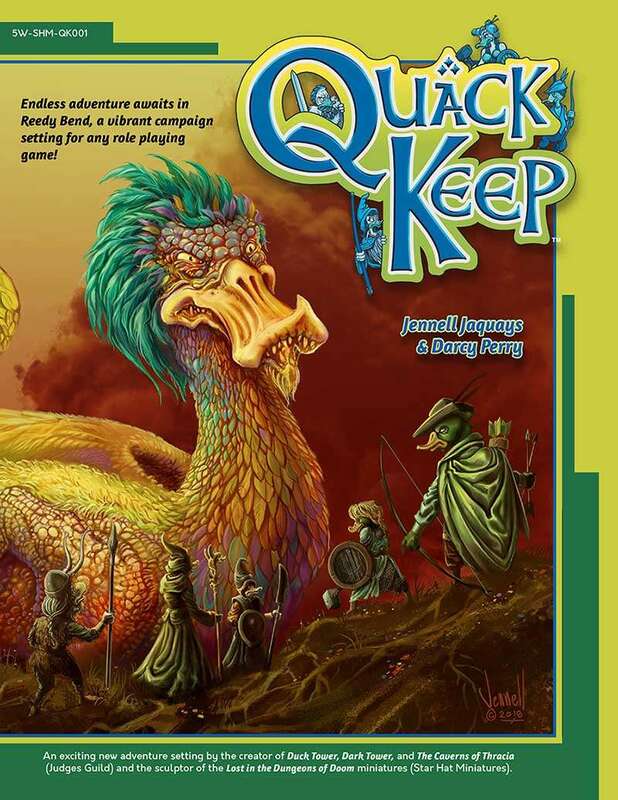 Starting point: Quack Keep began as a collaboration idea for a kickstarter with Darcy Perry of Star Hat Miniatures in New Zealand. His most recent kickstarter had featured several duck character, including one, Jenn Jaquack, that was a tribute to me. We talked about me creating an old school feeling adventure featuring his duck characters. This was in the summer of 2017. We shot for a Kickstarter that would launch in November and finish before Christmas. I pitched Darcy a number of ideas for more duck characters and some of those made it into the every-growing list of characters that he sculpted (The Grey Moulter, Mr. Froduck (an illustration that I did in the early 80s, I think), Goodie Green and her husband Dabbler, Mother Henna, and Whimsica de Loon). Not sure what happened to my Fafhrd pastiche character. I came up the idea for the title, the logo art, the cover, and the big monster on it. It’s a tribute piece to both the title of Andre Norton’s novel Quag Keep, the first D&D novel ever published and the cover of the book by American science fiction artist and author Jack Gaughan. 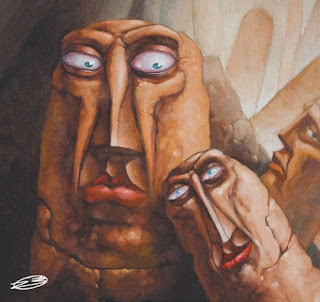 This was not the first time that I used Gaughan’s styling for my art. My first professional art credits in a table top game were for Chitin I: The Harvest Wars from Metagaming Concepts. The game was loosely based on Jack Vance’s novella, The Dragon Masters. The “dragons” in that book were what I call “insecta-reptilloid” creatures, not really dragons. Jack Gaughan was the artist for the original printing of the story… in one of the SF magazines of its time, I think. Metagaming wanted me to base my art on Gaughan’s. Darcy got busy sculpting, and I went offline (at least from being able to work) for over two months due to major surgery and recovery where I couldn’t set a computer for any length of time followed by losing nearly another three months due to packing for and un packing from an interstate move of our household. In the process, the kickstarter ran, did quite well, and finished. Darcy kept sculpting all the while and I finally was able to get down to the process of designing, writing, doing art, maps, and production. The book was always intended to be a black and white booklet with a tri fold GM screen. The cover art was created and formatted to originally fit that trifold. All the color maps and keys from the book were on the inside of that. In the end, that is what we delivered to our kickstarter backers. If you buy the book from Star Hat’s inventory, you will get this original version. The book available on Drivethru is essentially, the second edition. The Kickstarter version was formatted to fit the print standards of the printer we used in New Zealand. Content would be entirely black and white, and the book would be saddle-stitched (stapled along the spine). For Drivethru, the book would be perfect bound, meaning completely different print proportions and to include the maps, would be printed in color. Since we were committing to color for this version, that meant we could do everything in color. I started with a parchment background (same as on the maps) and began digitally coloring Darcy’s pencil drawings, my illustrations, and some of the clip art. Some came out better than others. Sadly, the vignette style art didn’t mesh perfectly with the color backgrounds and there were noticeable flaws. So… after finishing a completely color version of the interior, I backtracked to white paper with some color vignette illustrations. The Storyscale system is loosely based on a combination of my original Central Casting system and the Agile system used in software development to estimate the complexity/difficulty of tasks during development. One of the few things I took away (professionally) from my time at CCP. The numbers represent approximations, estimates and the scale is intended to be based more on a hyperbolic curve than a straight line. The difference between the abilities of someone who is average (2) and someone who is mythical (100) are intended to be that extreme. The idea is that these are all relative to the abilities of the player characters in the story, where they are assumed to be Exceptional (5) as a starting point. My hope is that the GM could scale how they assigned stat values to the NPCs and maybe monsters so their challenge levels would work regardless of the level of the player characters involved. Sounds like that needs more development and explanation. Why not set it up for 5th Edition? Because. Because not everyone plays 5th edition. Because we didn’t want this to be a d20 system only. 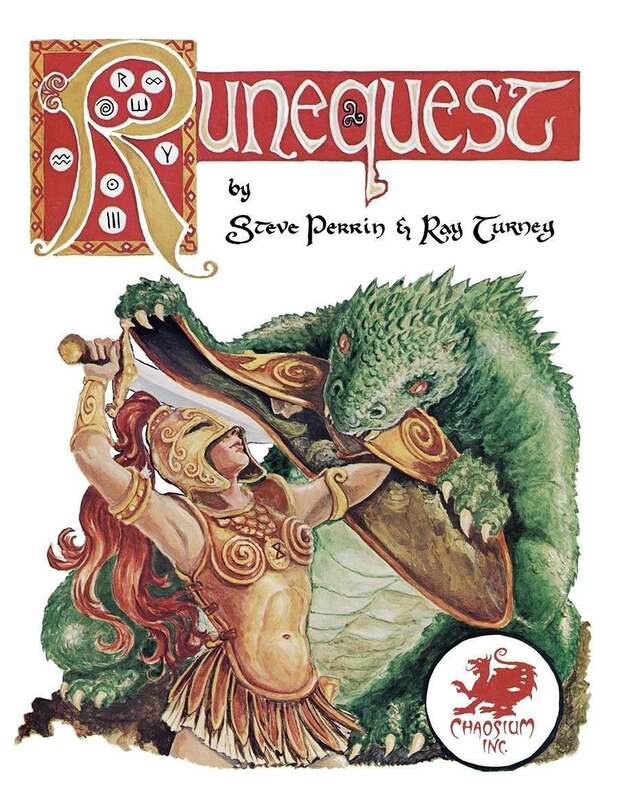 Because people play Runequest, older versions and retro clones, of D&D, Pathfinder, Dragon Age, Fantasy Age, and more. Because in 5 or 10 years, people may not be playing any of these systems and be playing something else. As I got into writing the book, I realized it was going to be mostly about the characters we were creating. They would occupy most of the book. The setting would be their home. If possible, it would make sense why they were all there in the same place. And even though many of them were homages to popular culture, classic fantasy heroes, and even to friends and ourselves, I did my best to make them be engaging and interesting as characters. Even the villains would have some sense of relatable “humanity” often rooted in tragedy or unintended consequences. The setting is a blend of ideas from Darcy and me, developed into a timeline and a reason for being. Story bits are often told in association with the characters they affect, rather than continuous narratives. As you noted, it’s a “Sandbox.” But then, that’s been the case with a lot of my best pieces, like Griffin Mountain, the Enchanted Wood, and even Duck Tower. I realized that making this into a single adventure defeated the purpose of the character richness. It needed to be a setting, not a single adventure. That meant not everything got equal treatment. 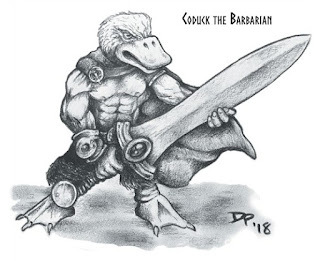 And there wouldn’t be space to include dungeon treatments for everything, like Quack Keep or the Whispering Tower (Which was included because of the Eldritch Swansong … with other characters stepping into fill eternal champion roles). By leaving holes in the setting like that, GM’s could fill them with material from other sources… and Reedy Bend would be flexible enough for them to fit right in. 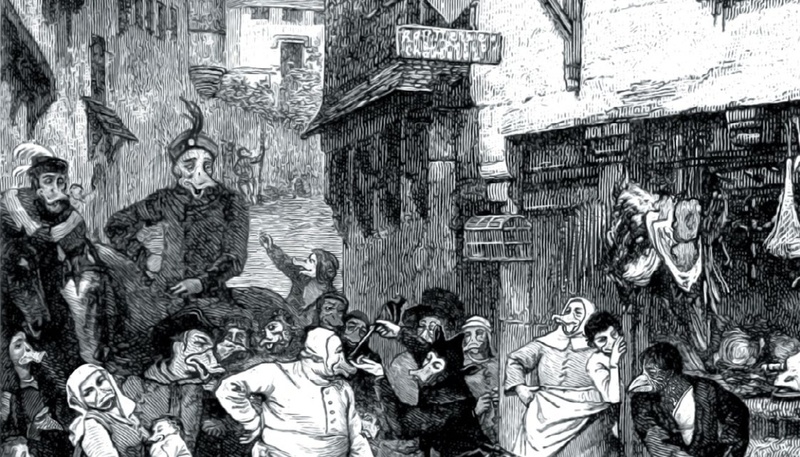 The descriptions of the Fowl Folk first appeared in Quack Keep. I copied, pasted and rewrote them into The Dragon’s Secret along with their S&W stats as an afterthought (when I reformatted that book to fit into Drivethru). I won’t promise that I’ll go back through the PDF version of Quack Keep and put in all manner of links anytime soon, but I suspect that I’m going to need to figure that out for Central Casting, and if I do, I may go back into Quack Keep for an update. Going forward, I’ve been working on several other projects for table top gaming, none having anything to do with Quack Keep right now. Thank you for the reply! It was both an interesting look behind the curtain, and also enlightening. Now that you mention Agile the SSS makes more sense. Still, a downloadable conversion guide would be very handy, most of us still play games related to D&D or Chaosium d100 (which will still be relevant in 10 years in some form), and grasps six-seven stats on a scale of 3-18 easier. I have to admit, I'm unfamiliar with the Central Casting books. Maybe it's time I did something against this issue. I'm glad you made Quack Keep a sandbox, and not only because it's my favorite way of running campaigns. DriveThruRPG is full of dungeons, but sandboxes are few and far between compared to them. Quack Keep wasn't just a pleasant surprise, but also a breath of fresh air between reading two more dungeon modules. You mention that none of your current projects have anything to do with Quack Keep now. Does this mean the multiverse of The Dragon's Secret and Quack Keep is also on hold for now? I'm juggling between the world I described in The Dragons' Secret (I have three adventure projects developing in that right now), and my rewrite of Central Casting, and doing design for 3D printing with a thought towards marketing my designs. Glad to hear you didn't drop the setting! I think I won't rush to buy Central Casting then, I will wait for your rewrite.